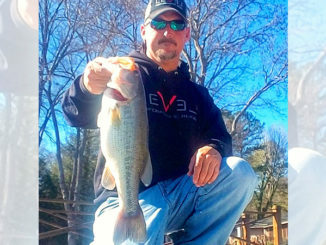 I have always said that, in the Carolinas, March is the best month to catch a really big fish, but really, January and February can be awfully good, and with deer season over in the Carolinas, you have people starting to get back on the water — some not as much as others because of the cold. I like to target big fish, but in January, when you find fish, you usually find them ganged up, so you can have some really good days, as far as numbers are concerned. You’re looking for fish and baitfish, and I can find them when my Humminbird electronics. The key is, it’s important to be fishing on the main-lake or main-river channel, or on deeper creek channels. Those are the places where bass are relating. They can be up the lake or down the lake, but they’ll be on that channel. Down the lake, you might be two miles from the shoreline, but with our electronics, we can find the old river channel — a lot easier than we could 20 years ago. I am looking for fish to be in deep water, and that can mean 20 to 30 feet of water, all the way down to 40 or 45 feet of water. You’re looking for baitfish, and when you find them, you’ll often find bass and all kinds of other predator fish: striped bass, white perch, spotted bass in lakes that have them. There will be a lot of species hanging around that old river channel. When I find fish, I like to use bigger baits. I think those big bass like to eat a big meal all at once, and gizzard shad are at the top of the food chain for largemouth bass. So I’m going to fish a big spoon or a big swimbait. I’ll fish a 41/2- or 51/2-inch Storm GT360 swimbait, or I’ll fish the bigger Largo Shad, a swimbait that’s in Storm’s coastal line. 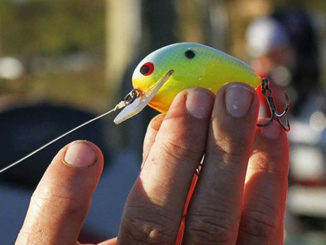 A big swimbait, like this Storm 360GT swimbait. fished in deep water, is a great way to tempt a big bass to bite — if you fish it slowly, barely crawling it along the bottom. Depending on the depth of the water and the wind, I will be adjusting the size of the jighead to get the bait down. The other thing is, I want to be able to fish this bait real close to the bottom, bumping it along, maintaining contact with the bottom. You have to reel it very slowly. You have a bait with a big profile, and you’re slow-rolling it close to the bottom. But you’ll need to adjust the size or your jighead depending on whether they’re in 20 or 30 or 45 feet of water. 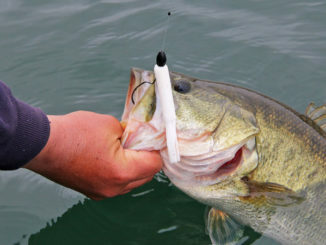 Bass are not as likely to suspend in January as they are at other times of the year. It would be easy to use a 1-ounce jighead to get the bait deep, but to keep it close to the bottom, you have to reel that big jighead faster than I want to. I like to fish something between a 3/8- and 3/4-ounce head. I like the 3/8-ounce, but if you’re fishing a big 360GT in 40 feet of water, and it’s windy, you might have to go up. 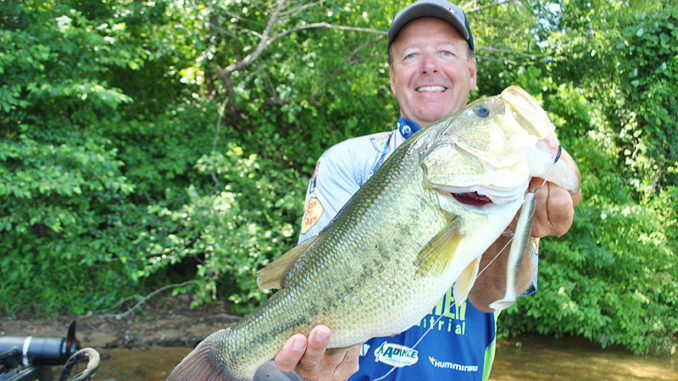 You want to experiment with different weights until you get one that you can get to the bottom, then keep it close to the bottom on a slow retrieve. I’ll fish a big swimbait on a 7-foot, medium-action Bass Pro Shops Carbonlite baitcasting rod with a Johnny Morris Signature Series reel spooled with 12- to 14-pound XPS fluorocarbon. I want the reel to have a slow retrieve ratio so I can reel the bait back slowly. Lure colors depend on the water clarity. Herring colors are good, and I like to fish a straight pearl or white bait. I’ll dip the tail chartreuse if there’s a little stain in the water. Now, put all of this together, and we still have one huge thing to discuss: patience. You might fish a half-day or three-quarters of a day without catching anything, even though you’re marking bait and fish. So you have to be patient and just keep working. When you pull up on the right place and find them in the right mood, you can have a great day. It’s a great way to catch a big fish, and I’ve had some of my biggest days in terms of total numbers on days like this: maybe 10 or 15 largemouth bass, 10 or 15 stripers, 30 or 40 white perch. You have a chance to have one of those days that you’ll never forget. Yes, it’s nice to catch a warm day where you’re fishing in 50- or 60-degree water, but the best fishing is when the water temperature is in the 40s. If you can catch a day like that, don’t miss the chance to fish it. And remember, go slow, be patient, and use your electronics.